With a year to go before the opening of the US$5.25 billion Panama Canal expansion there is a frenzy of activity in some ports and even angst in others throughout North America’s East and West Coasts. Some port authorities are busily deepening shipping channels, beefing up berths, and preparing for an influx of larger vessels — up to 13,000 TEUs (20-foot equivalent units) for container ships from the current capacity of 5,000 TEUs, or up to 120,000dwt for dry bulkers and others — with billions of dollars currently being spent on capital projects. Work began on the Panama Canal addition of a third lane for shipping way back in September 2007 using reinforced steel for the first time, more concrete than used in the entire canal locks before, a series of 16 rolling gates, and dredging at both the Pacific and Atlantic entrances. The expansion was initially due to be open and operating by now. However, hassles over contracts with the building consortium Grupo Unidos Por el Canal (GUPC) and consequent cost overruns have bumped the opening date to April 2016. One estimate puts lost revenues from the delayed opening caused by the dispute at over US$400 million so far. However, the delay has also helped some United States ports get better prepared. The South Carolina Ports Authority in Charleston is several years into a ten-year US$1.3 billion capital plan with another $725 million of port-related infrastructure projects being funded by the State Government. Major among these projects is the deepening of the Charleston Harbour to 52 feet by the end of the decade. Wharf strengthening at the Wando Welch Terminal will allow it to handle larger ships up to 14,000 TEUs. Two new super-post-Panamax cranes are arriving in the spring of 2017. The Port of Houston Authority is committing US$275 million for significant infrastructure improvements to allow it to handle larger vessels for containers and for bulk and general cargo. The Georgia Ports Authority has begun a US$135 million Savannah Harbour Expansion Project to deepen the main river channel to 54 feet at high tide, which will allow it to take Super post- Panamax vessels from the Suez Canal and the post-Panamax ships from the expanded Panama Canal. But, the Panama Canal expansion is also good news for bulk shippers. As well as shipping and receiving more trade by container, there are also prospects for increasing dry bulk shipments including coal from Canada to countries such as Brazil using larger Post-Panamax vessels. Chemical and polymer shipments are also expected to increase from the US Gulf ports, especially to Asia. Interestingly, of the world’s 100 largest container ships, over half are in the 13,000 TEU range, which the Panama Canal will be able to handle by next April. However, with container ships around the world now up to 20,000 TEUs, the move to 13,000 TEUs by the Panama Canal Authority could be too little, too late. The Suez Canal in Egypt — with no locks and no apparent shipping restrictions except for supertankers — has been open since 1869 and is well ahead of the Panama Canal in capacity even with the latest major expansion. About 50 vessels a day use the Suez, travelling in convoys and using bypasses along the canal with its depth of 24 metres. This autumn should see the completion of a second canal for half of the length of the Suez in an $8.4 billion project aimed at increasing the canal’s capacity. No wonder the Panama Canal Authority is already talking of another expansion as it nears the opening of the current one. This even more ambitious project will cost $17 billion and would allow the canal to handle the world’s largest container ships and battle the Suez Canal head on. It took six years of research and over 100 studies to prove the economic feasibility, market demand, environmental impact and other technical engineering aspects of the current Panama expansion. 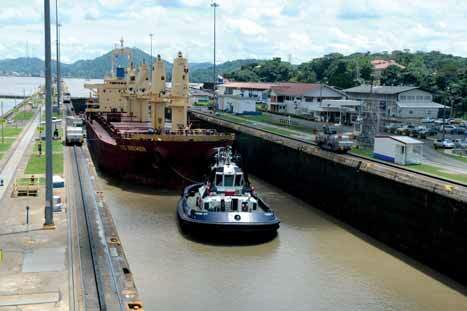 Panama Canal Authority head Jorge Quijano says a fourth set of locks could be completed within 15 years and meetings have already been held with possible financiers from China. Not to be outdone, a Chinese businessman is continuing to pursue an idea to build a rival $50 billion canal across Nicaragua, but so far it remains just an expensive dream according to some industry experts. Meanwhile, the continuing congestion in the Ports of Los Angeles and Long Beach following trucking and a tentatively settled waterfront contract dispute has meant the loss of valuable business. The malaise has encouraged some Asian shippers to use the Suez Canal rather than the West Coast Ports and rail to get to the major North American markets in the Mid-West and on the East Coast.There were nine vessels still at anchor outside the Los Angeles breakwater early in April. “Our congestion problems have seen more of our cargo moving to the East Coast than usual and I know that the ports of Savannah and New York-New Jersey are busy,” says Marcel van Dijk, marketing manager for the Port of Los Angeles. Rather than coming directly to the West Coast, van Dijk says some cargo owners “don’t see the love here on the West Coast anymore” and are exploring sending more of their cargo through the Panama Canal or the Suez Canal if the logistics are there. The Port of Los Angeles isn’t taking the declining traffic sitting down and van Dijk says “we’re stepping up our play to keep our market share,” as it digs out of its congestion problems. The troubles have brought the rival Ports of Los Angeles and Long Beach more closely together spending billions of dollars on dredging deeper shipping channels; improving on-dock rail services; and other harbour upgrades. And van Dijk says the major railways don’t want to lose business either and are beefing up their services across to the US mid-west. At the Port of Long Beach, the Director of Business Development, Don Snyder, says work is continuing on infrastructure improvements including numerous capital projects to smooth the interface between ship and land facilities. Terminal tenants continue to invest heavily on new equipment “to make sure the interface is as good as it can be,” and there is a standing dredging committee keeping the main shipping channels open. Long Beach has a new CEO since last June in Jon Slangerup and he has championed the improvements of infrastructure, but he is also insistent that there has to be changes in how the port operates. With the approval of the US Federal Maritime Commission earlier this year, Slangerup and his executive team held their first meeting with Port of Los Angeles Executive Director, Gene Seroka, himself relatively new, and the POLA executive team on ways both ports can improve supply chain efficiencies. The ports, which face the threat of losing business to the expanded Panama Canal, are not prepared to sit around and wait to see if there is any cargo fall off. With the new collaboration they intend to refine the efficiency of marine terminal, trucking, rail and vessel operations. They also plan to discuss legislative advocacy, security enhancements, infrastructure, technology and environmental improvements related to supply chain organization. The previous Port of Los Angeles Executive Director, Geraldine Knatz, who is now jointly a professor at the University of Southern California in Los Angeles Price School of Public Policy and the USC Viterbi School of Engineering, recently told US Congress just what the Panama Canal expansion will mean for North America. After visiting the canal expansion project she raised some eyebrows when she said developments in the shipping industry around the world, particularly the consolidation of global marine operations, could be an even bigger threat than the Panama Canal expansion. Changes in the global ocean carrier industry and larger and larger container vessels could affect US ports differently. The West Coast already receives the big container ships, but the canal expansion means East Coast ports will receive cargo in fewer but larger ships. This could create more competition among East Coast ports many of which need infrastructure improvements to handle the bigger ships, she told members of Congress. And that could be the bigger challenge ahead.